Manchester United boss Louis van Gaal says keeper David De Gea is not "capable" of playing in Saturday's season opener against Tottenham. De Gea, 24, reportedly wants to move to Real Madrid with speculation over his future persisting all summer. "We've observed him in training and matches and he's not the David De Gea of last year," said Van Gaal. New signing Sergio Romero, 28, Anders Lindegaard, 31, or Sam Johnstone, 22, could replace De Gea. Lindegaard and Johnstone travelled on the club's summer US tour, but neither played for United last season. Lindegaard did not feature once in the previous campaign, while Johnstone has yet to make his United debut. United also have Victor Valdes, but the 33-year-old Spaniard has been made available for transfer after Van Gaal claimed he "refused to play" in the reserves. 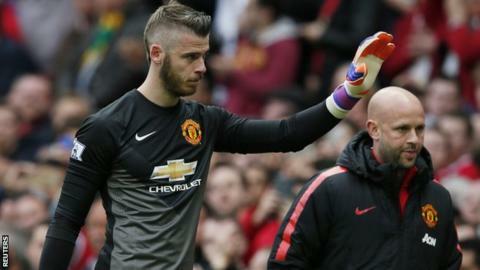 "De Gea tries and does his utmost best, but it's a difficult situation," added Van Gaal. "Now we have to play our first match and I want players who can focus only on the match and he is not capable to do that. De Gea has made 175 appearances since joining United from Real's city rivals Atletico Madrid in 2011. United are believed to be holding out for a deal that includes Real defender Sergio Ramos coming to Old Trafford. Angel Di Maria has written an open letter to United supporters, following his £44.3m move to Paris St-Germain. The 27-year-old Argentina midfielder conceded his one season at Old Trafford "did not go well". "I can guarantee you it was not for trying," he said in his letter. "I did my best but football is not like maths: often a lot of things out of our control affect the way we feel and the way things turn out. "I am sorry it did not work out as I would have wished in this amazing, huge club." Van Gaal, who will reportedly sign Barcelona's Pedro as a replacement, said Di Maria's exit would be a "big loss". But the United boss suggested Di Maria may have struggled to adapt to life in the Premier League. "I want more attackers with speed and creativity," he said. "Di Maria is one of those players so we have to look for that kind of player, but they have to have the talent to cope with the English rhythm and that's difficult to find. "That's why players are not having success in this competition - because of the rhythm of the game and the English culture is a different culture to the Latin culture." Red Devils winger Ashley Young has signed a new deal until 2018, with the option of a further year. The 30-year-old England international has made 115 appearances and scored 13 goals since joining from Aston Villa for a reported £17m in 2011. Van Gaal described Young as a "multi-functional player" who "flourished" last season. Young said: "The spirit and motivation amongst this team is very high and we are all determined to make this a season to remember." New signing Bastian Schweinsteiger will not play against Spurs, with Van Gaal saying he lacks match fitness. There were concerns raised over the German's condition after Pep Guardiola, his boss at Bayern Munich, said the 31-year-old midfielder had not been fully fit for three years. "Schweinsteiger came to us at the last moment, out of his holidays," said Van Gaal. "I don't think he's fit enough, so we have to build him to the fitness I think he needs." Argentina defender Marcos Rojo is also not expected to start against Spurs.